My kid loves to eat. And he's not the most super patient little guy when he's waiting for his food. So, when it comes time to eat, getting a meal prepped and on his tray quickly is key. Plus, I like to dig into this meal too--it's simple, a cinch to make, and easy for baby to eat. 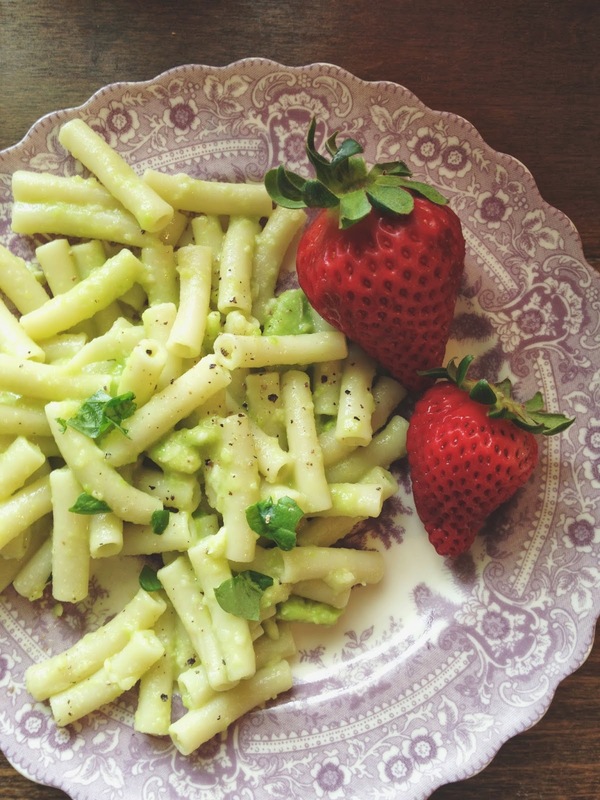 While the pasta is cooking, smash up an avocado and add a splash of lemon (not too much). You can also add in some basil and a little parmesan cheese too. Then, mix the cooked pasta and mashed up avocado mixture. I give Luke his avocado pasta without salt and pepper. But, I like to give mine a good sprinkling of spices! I've also added in sausage to give it a little more oomph. What your favorite baby and momma-friendly meals? Yum! This sounds so tasty :) We've been eating a lot more avocado since Maggie started solids...love the excuse to buy them! and I love when she doesn't finish her portion (but that's happening less and less lately).